Posted on December 14, 2009 by Debito Arudou Ph.D.
Hi Blog. 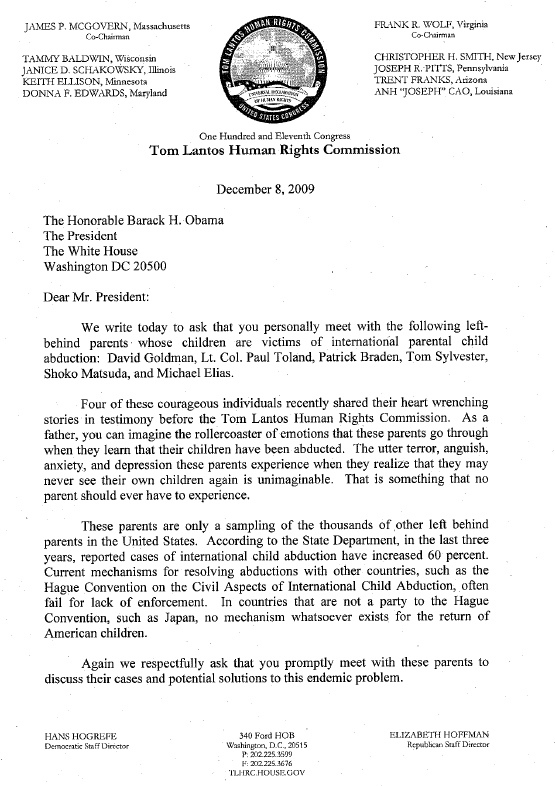 Last week I reported on the US Congress’s investigation of Japan as a haven for international child abductions, and a December 4, 2009 hearing that many of the Left-Behind Parents attended and issued statements to. 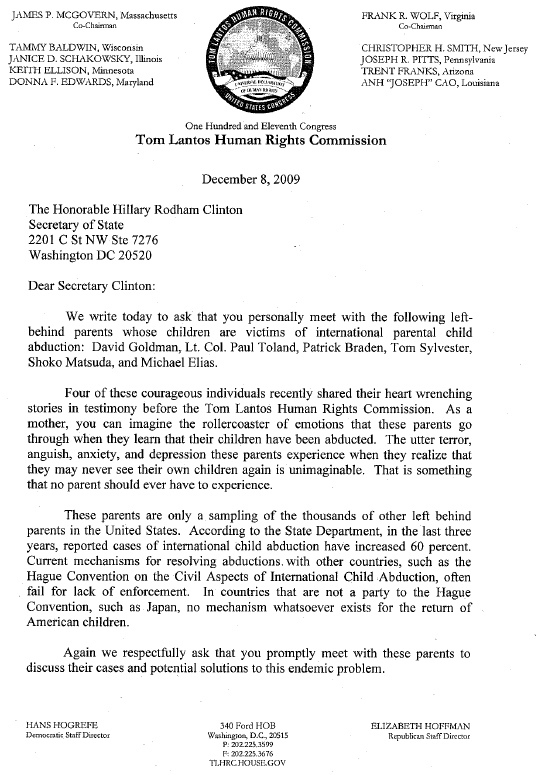 The Congressman Lantos Human Rights Commission has since issued letters, signed by several Congresspeople, to President Obama and Secretary of State Clinton, requesting they personally meet with select representatives of the LBP and consider their issue. 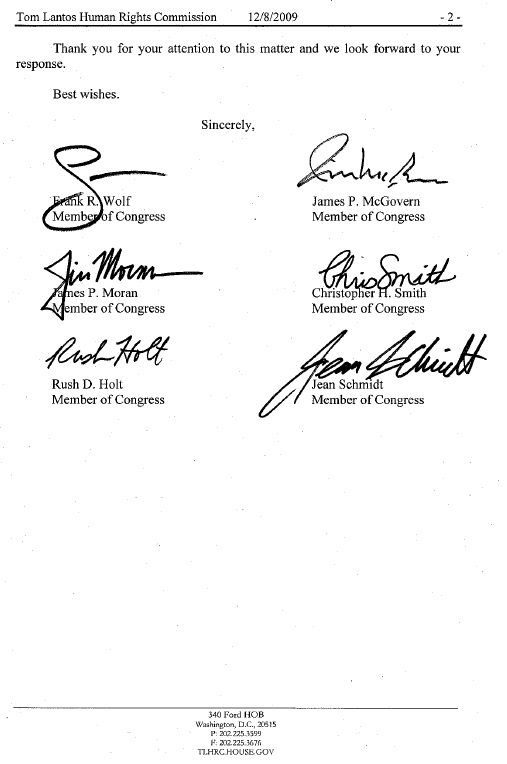 Scans of those letters enclosed below. 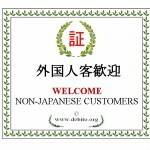 I am a former American citizen (named David Christopher Aldwinckle) who became a Japanese citizen in October 2000. I have been living in Japan permanently since 1993, for a total of nearly 23 years. I wish to offer my testimony to Congress, as a divorced and left-behind father in Japan (who hasn’t seen his children for years), and from the perspective an immigrant. I hope to demonstrate how Japan needs drastic reforms to its child-custody and visitation system, not only for the benefit of its international marriages, but also for its own citizens. Japan has not changed its divorce laws significantly since 1898 (Source: Harald Fuess, Divorce in Japan), particularly in regards to child custody and visitation. Its family registration system treats children like property, since after divorce children’s names are annotated on only one parent’s Family Register (koseki). 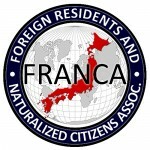 This means joint custody is legally impossible in Japan (particularly for non-citizens, who by definition do not have a Japanese Family Register). The Registry System is used as grounds to sever one parent legally from a child’s life, a violation of children’s rights to be legally tied to and have access to both parents. Additionally, child visitation, although technically permissible through negotiated Family Court settlement, is unenforceable in Japan. There are no criminal penalties if the custodial parent unilaterally decides to deny visitation with the non-custodial parent, and no effective enforcement mechanism exists in Japan’s administrative bodies to ensure that both sides keep their promises. Moreover, Japan’s flawed alimony child-support system (custodial mothers are legally entitled to receive benefits from the father, but custodial fathers are not; moreover enforcement in any case is often weak and needs time-consuming court orders) means that in a post-divorce dispute, “Fortress Moms” (who isolate the children) and “Deadbeat Dads” (who disappear financially, sometimes even change jobs to become untraceable) are not unusual in Japan. None of this is beneficial to Japanese society, and if there is a (strong) chance that one parent will lose all access to his or her children after divorce, this is not encouraging for Japan’s future. Things are already unsustainable — with a rapidly-aging society and record-low birthrates below replacement levels. In sum, it is my belief that, with Family Laws in Japan as they stand, nobody (Japanese citizen or non-Japanese) should get married and have children in Japan. The risk is just too great. Too many children are getting hurt by a system that encourages Parental Alienation Syndrome, and creates single-parent households that can be acrimonious to the point of deterring the children from becoming parents themselves. 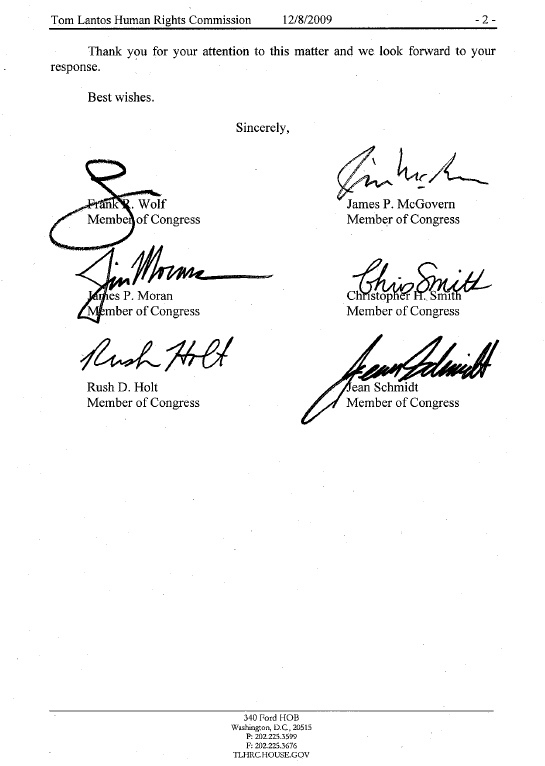 I urge Congress to encourage Japan not only to sign the Hague Convention on Child Abductions, but also reform its long-outdated Family Law structure. Allow for joint custody and enforced child visitation backed up by criminal law penalties — for the sake of not only American citizens, but also us Japanese citizens. you made some really good points debito, and i agree that the GOJ should wake-up and sign the damn treaty already. i mean what are they waiting for? The President and the Secretary of State has to step up to the plate and stop playing politics with our children. I cannot understand how the President traveled through Asia speaking of human rights, fundamental freedoms, and universal rights but said nothing about American Citizens rights to access to their children. Debito: your conclusion is incredible — (“nobody (Japanese citizen or non-Japanese) should get married and have children in Japan” — but no less so are all the facts that led you to make it. I in particular wonder what percentage of the population in Japan is aware of these outdated divorce laws. I think he was the only Holocaust survivor in Congress. He was well aware of the Yasukuni right-wing issue in Japan, one of the few who understood the moral implications/wrongs of fascist Japan (Showa 0’s and 10’s). Lived to age 80 and died last year. the above Brazil abduction case just got resolved in favor of the father today by the Brazil Supreme Ct (they overturned a stay on the US court’s ruling in favor of the father). …but NBC news (I’m watching this story right now on channel 4) said that it was because the US passed some kind of bill giving Brazil a bunch of money or something (I kind of missed it…does any one know about this part?) that helped promote the ending of this story.